Here is another recipe from Vegan With A Vengeance, by Isa Chandra Moskowitz. 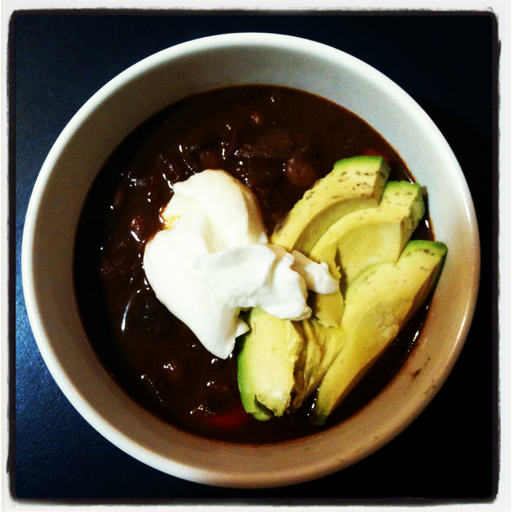 I was very excited to make this chili because I adore mole, and let me tell you, if I was the type of person who liked really spicy food, I would be raving about it. Unfortunately I can't handle it. I am going to make this again and tone down the spice, probably by omitting the chile powder and just use the jalapeño. It was a pretty big letdown to not be able to eat my creation, especially after I dressed it up with avocado slices and plain yogurt. However, I didn't want it to go to waste, so I put it in the freezer and have been trying to foist it off on my heat-loving friends. I almost would've gotten rid of a container of it today, too, if my friend's bag hadn't been too full already! So my final review is, make this according to the recipe I'm posting if you like spicy food, and proceed with caution and experiment with the spice if you're a little more sensitive. Preheat a Dutch oven or large pot over medium-high heat; pour in and heat the olive oil. Add the onions and peppers and sauté for two minutes, then add the garlic and seitan. Cook for eight minutes, until onions are soft. Add the chile powder, cinnamon, and cumin, stirring constantly for another minute. Add the tomatoes, cocoa powder, and molasses. Stir and break up the tomatoes with the back of a spoon, then add the beans and vegetable broth. Cover and bring to a gentle boil, then lower the heat and simmer for about 30 minutes. Allow to sit at least 20 minutes before serving.